November 13, 2018 – Los Angeles – On Wednesday, January 16, 2019 Chris Cornell’s legacy and contribution to music history will be honored with a star-studded concert event, I Am The Highway: A Tribute to Chris Cornell, at the “Fabulous” Forum in Los Angeles. 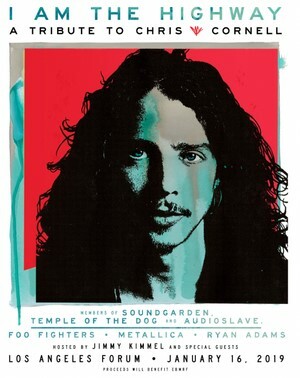 I Am The Highway: A Tribute to Chris Cornell will be an epic night of music, taking fans on an unforgettable journey through Chris’ legendary career and catalogue, with performances by members of Soundgarden, Audioslave, Temple of the Dog, plus special performances by Foo Fighters, Metallica and Ryan Adams and more. Each ticket purchased online for the I Am The Highway: A Tribute to Chris Cornell at The Forum will include a copy of Cornell’s self-titled career retrospective album. Visit http://www.chriscornell.com/ for additional details. The host committee includes Vicky Cornell, Tom Morello, Matt Cameron, Brad Pitt, Josh and Kathryn Brolin, Jimmy Kimmel, Tom Hanks and Rita Wilson, Courteney Cox, Kaley Cuoco, David Spade, Linda Ramone, Andrea & Paul Joseph, Cynthia Pett, Peter Berg, Sam and Aaron Taylor-Johnson, Marc Gurvitz & Julianne Phillips, Ron Laffitte, Michael Rapino, Brent Smith and Lisa Engel, Michele Bernstein, Patrick Whitesell, Scott Sartiano, Michael Cooper, Nicholas Karayiannis, Eric Esrailian, and Paul and Renee Haas.